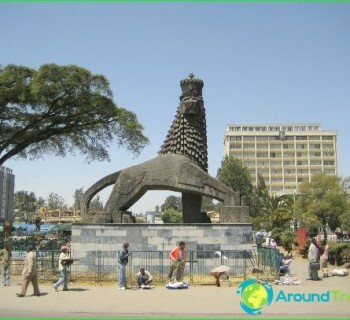 The population of Ethiopia is more than 93 million people. other nations (Somali, Sidamo, Afar, Agau, Tigrinya, Gurage). Amhara inhabit the towns and cities of provincesGojam, Shoa, Gonder, Tigrinya - province of Eritrea and Tigray, Oromo - the highlands of Ethiopia, Somalis - areas in south-east Ethiopia, gardens and kambatto - south-west of the country (mountains) and the Afar and Saho - wander along the Danakil desert. In addition, in Ethiopia there are Armenians and Greeks (Addis Ababa and other major cities), as well as Arabs - came from Sudan and Yemen (east of the country). On the 1 sq km is home to 77 people, but the most densely populated areas of the Ethiopian highlands, and the least populated province of Bale (population density - 6 people per 1 square kilometer). 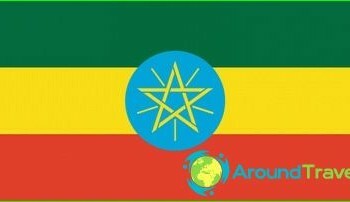 Official language - Amharic (English - in fact, the second official language). Big cities: Addis Ababa, Nazret, Dire Dawa, Gondar, Harer. Residents of Ethiopia profess Islam, Christianity (Monophysitism), paganism. 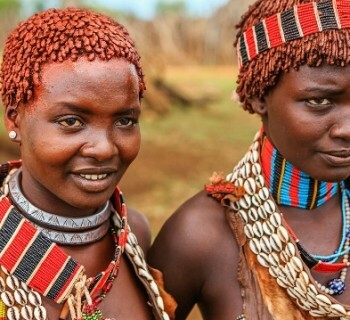 On average, residents of Ethiopia live up to 47 years. More recently, almost in Ethiopiathere was no public health system. Today, Addis Ababa and all provincial centers have clinics, hospitals and health posts. But despite this, in the 47,000 residents here accounts for only 1 doctor. The main problems in the country - AIDS (they are infected 5%people, including 250,000 children), widespread famine due to food shortages, acute need for humanitarian assistance. Black fever (a tropical disease caused by parasites that affect the immune system), yellow fever, malaria - spread deadly diseases in Ethiopia. Residents of Ethiopia - honest and courageous people who are raising their children in respect for parents and the older generation. As for the wedding traditions, the girlsmarry as soon as they reach 12-13 years. Particularly noteworthy tradition Surma tribe - a few months before the wedding, the girls in the lower lip is inserted into a clay disc, pre-puncture the lip. And after a while they removed the 2 lower teeth, so they do not interfere with the disk location (disk size depends on the bride's dowry: the richer it is, the greater should be the drive). On the day of the wedding the groom must go to the house of the bride, but it will not let go until until it will dance and sing songs and rhymes. If you are thinking in Ethiopia, show the maximumcaution in the diet - often food is stored here is not so, as is customary in Europe, so there are cases of poisoning and other diseases.